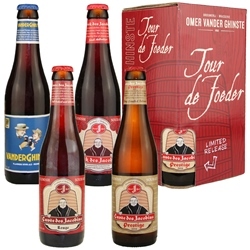 The Tour de Foeder is a collection of 4 Flemish Sour Ales from Omer Vander Ghinste Brewery -- one 11.2 oz. bottle each of Cuvée Des Jacobins, Kriek des Jacobins, and Vander Ghinste Oud Bruin, plus a special release -- in this case the 2018 release of Cuvée des Jacobins Prestige. Cuvée Des Jacobins Rouge (ABV 5.5%) is a 100% foeder beer, an undiluted lambic that has been matured in oak casks (foeders) for 18 months resulting in a robust and complex sour beer with notes of vanilla, dried cherries, stone fruits, and cocoa. Awarded a Silver Medal at the Brussels Beer Challenge 2013, and a Gold Medal at the World Beer Awards 2014. Kriek des Jacobins (ABV 4.5%) is a combination of 50% foederbeer (spontaneously fermented and matured in oak casks)and 50% young beer. Its full cherry "Kriek" flavor and aroma are derived from natural cherry juice which is added to the brew. Fruity, balanced, and slightly sweet, it's an excellent thirst quencher. Vander Ghinste Oud Bruin (Roodbruin) (ABV 5.5%) was originally called "Ouden Tripel"; this ancient beer is top fermented using malted barley, wheat, hops, water, and caramelized malts. The resulting beer is blended with lambic that has aged in oak barrels for 18 months. Its flavor is characterized by a well-balanced, slight sourness. Named World's Best Dark Beer at the World Beer Awards 2015. Cuvée Des Jacobins Prestige 2018 (ABV 6.6%) is a blend of 24-month-old foederbier, spontaneously fermented in and blended from foeders IX, XI and XIV. Like the Cuvée Rouge, it's bracingly sour, but the balance is finer and tipped more toward stone fruit. It has a deeper brettanomyces character and is soft and fruity overall, with the complexity of true spontaneous fermentation which cannot be equaled by any other method. Extended aging brings about different stages of fermentation, each adding its own note. Cerevisiae, brettanomyces, and lactobacillus are like voices in a choir—a truly gifted brewer can bring them into harmony. A perfect accompaniment to shellfish, shrimp or pork tenderloin. These slightly sour brews enhance the creaminess of a fresh, young, goat cheese. Also lovely with zesty salads or peppery style cheeses like Monterey or Pepper Jack and pungent style cheeses like Gorgonzola and Limburger. Serve at 43 - 47 degrees F.
The Omer Vander Ghinste Brewery, named for its founder, began commercial brewing operations in 1892, and has been continuously in family hands since then. 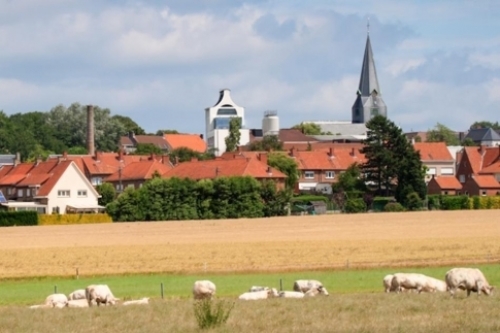 Still located in Bellegem, a village in the Flanders region of Belgium near the French border, the brewery released its very first ale to high acclaim and its fortunes have flourished ever since. Helmed by five generations of the Vander Ghinste family – of whom all first-born sons are by tradition named Omer – Bockor depended upon a combination of brewers' craft, innovation, marketing savvy and tenacity to grow into an international brand, yet still it maintains close ties to the village in which it was born, striking a balance between modernity and tradition.